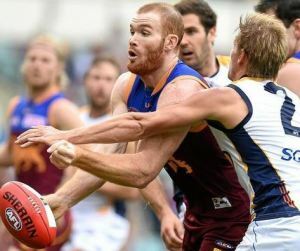 AUSTRALIAN RULES: Brisbane Lions icon Daniel Merrett has linked with the Caloundra Panthers. The 32-year-old, who only left the big time in August after playing 200 games for the Lions, officially signed with the Panthers on Wednesday. The 195cm, 103kg defender is set to play the majority of Caloundra's remaining games in south-east Queensland's division one competition this season. Club president Russell Evans was delighted to welcome Merrett to North Street, although he won't lace-up until at least May 20 due to a two-game suspension which has carried over from the AFL. "He will add a lot of experience and help our young players stand a bit taller,” he said. "Before the game and during the game and after the game, he will be a really valuable mentor for our younger players. On the field, he's expected to cause plenty of damage. "He's been training with the Lions and is still mixed up with a whole bunch of things with the Lions so he's in pretty good nick,” Evans said. "He's got wonderful body positioning, he's got good hands and at this level his skills will be excellent. Merrett was a key component at the Lions from 2005 until 2016. He hung up his boots from the big time last year to spend more time with family and after losing some passion for playing at that level. But it's evident he still wants to keep some footing on the paddock, via the lower local league. 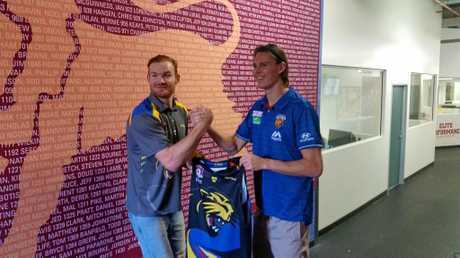 Panthers product and Lions up-and-comer Eric Hipwood presented Merrett with his Caloundra jersey. Evans said the club did not break the bank to secure the services of Merrett. "We're pretty lucky. In terms of being a paid player he's not too different for some of our better players so it really hasn't been about the money for him,” he said. The Panthers are win-less and ninth of 10 teams after three rounds of the Division 1 Hart Sport Cup. The team will face a Tigers unit on Saturday, which could boast another Lions stalwart in Robert Copeland.